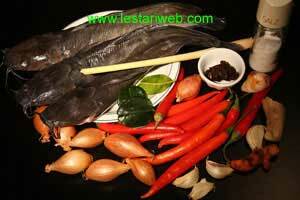 Here it is a typical cuisine of Riau mainland Province : Asam Pedas Ikan. 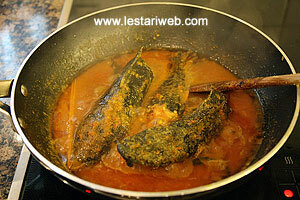 Asam Pedas literally means "Sour Spicy". 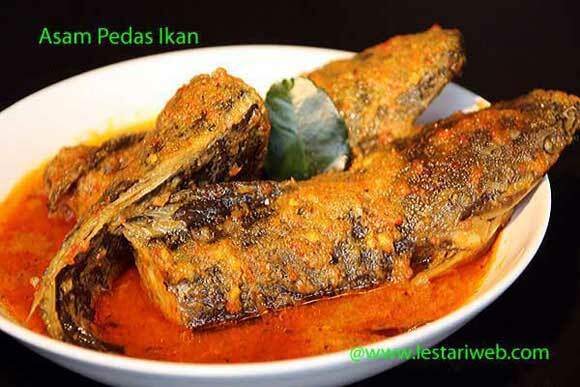 There are commonly 2 kinds of fish being used : With Ikan Baung, a kind of local catfish, the call it "Asam Pedas Baung & the other with Patin/Pangasius fish, called "Asam Pedas Patin". Unfortunately I can not afford this locally Baung fish here in Germany, so I used the normal cat fish which mostly available here in the western supermarket. Of course you can take any sort of fish as your choice. The sauce tastes very tasty, doesn't matter what kind of fish you cook. It's perfect combination between sour, fiery hot & hmmmm....my mouth is watering already ;-) So for you ..fish & chilli lovers, have a nice try & enjoy our sour spicy fish soup. Good Luck..
Add 600 ml water & bring all to boil.Meanwhile soak the tamarind pulp in warm water. Squeeze the tamarind pulp constantly to extract the flavor into the water. Drain the pulp and save the tamarind juice. 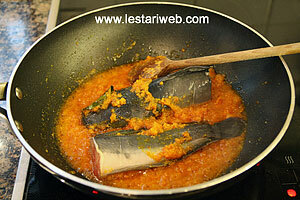 Add the fish into the pan, cover & simmer over medium heat until the fish is cooked. 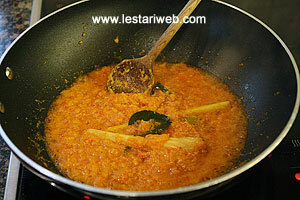 Add the sliced star fruit or young ananas (if any) & tamarind juice. Adjust the taste with salt & sugar. Stir to mix & remove from heat. Serve hot.